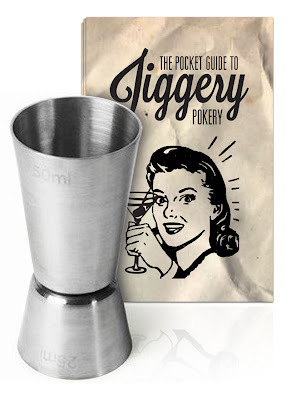 I'm a fan of making things easier, so firstly, let me introduce you to a jigger. You probably have one lurking in the back of your cupboard that you nicked from a bar in your student days, but if you didn't partake in university stealing, grab one here. This perfectly engineered device does one thing and one thing only… it measures 50ml and 25ml, which means simple, delicious drinks. But what use is a tool like that without a bit of help? If only there was a really simple print and fold guide to cocktail shaking you can easily make with a jigger and the spirits you probably have lying around your house. 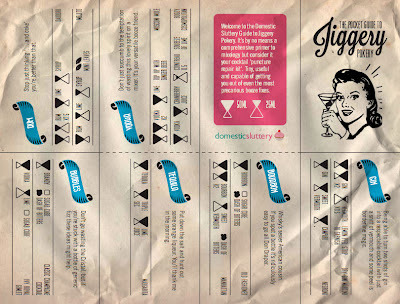 We've put together a printable cocktail guide for you. Download it from the link below, print it out, follow these instructions for folding it up and relax in the knowledge you can save any party from dull drinking and bad mixing. It's like you've folded up the Domestic Sluts and slipped them into your pocket like a little origami treat. Download the guide here, it's really quite fabulous. This might be my most favourite Domestic Sluttery piece EVER. I love this. So ace.